Auschwitz was a concentration camp that was the final resting place for millions of lives. Jews, Gypsy's, Greeks, Italians, Poles (people from Poland), Jewish sympathizers, and those with physical and/or mental disabilities lost their lives in Auschwitz. Auschwitz was the largest of the Nazi's concentration and death camps. Liberation, for approximately 7,600 sick or emaciated detainees, finally arrived on January 27, 1945. The estimated death toll at the camp was 1.1 to 1.5 million people. Throughout The Orphan's Tale, the Jews in the Circus Nuehoff are scared of random searches by the Schutzstaffel (SS). Which is how many Jews, Gypsies, and potential prisoners of war felt throughout their daily lives while hidden. Today the International Declaration of Human Rights works to prevent how many felt and were treated during the Holocaust. Yet today, many minority religions are being persecuted for what they believe in all throughout the Middle East due to ISIS and other terrorist groups. There is still a manipulation of how groups are perceived throughout the world. For example, Muslims are being stereotyped due to the activities of ISIS. Christians, when in the Middle East, are being killed based on their religion. Similar to the Nazi's treatment of Jews and prisoners, Kim Jong-un is forces everyone outside of the North Korean capitol into slave labor, but unlike the Nazi's he starts forcing children as young as age five. There needs to be an enforcement of the International Declaration of Human Rights in order to protect citizens of all nationalities and religious cultures. Without enforcement, these cultures will be one step closer to persecution and extermination. During the Holocaust, Helen Marks' mother hid her with a Catholic family when she was just a young child. She recounts what life was like in and out of the ghetto. Helen's story is one of remarkable luck for herself and members of her family. She tells of her Uncle's story, the few stories her father would tell her, and of course how her mother and her survived. Throughout the Holocaust many people viewed Germans and Nazi's as the same, when in fact there was a difference. We know what the Nazi's did, how they did it, and for the most part we have a general knowledge of why they created the genocide. But the Germans were different. Yes there were the ones that would help the Nazi's, but many did not like what the Nazi's were doing to the children. When a Jewish family was able to find a family of different religion, they would ask the family to take in their child and do whatever was necessary to keep the child safe (a Hidden Child). This is what Helen Marks' mom did when Helen was just over a year old. The number of Hidden Children is unknown, but the help of other religious families throughout Europe helped save the lives of thousands of children from the Nazi's plan. We know that the Jews had to wear the star of David pinned on their clothing everyday. But when we hear about the Holocaust, we only hear about what happened to the majority of the Jews, and most people choose to believe that the children where somewhat spared. That is something that needs to change. There were infants taken and put to death for being Jewish or non-Aryan, infants and toddlers who could not even provide their identification. In the minds of the Nazi's, children and women with children were unsuited for forced labor and deemed useless to the Nazi cause. Gypsy, Polish, Jewish, Greek, and Italian children had a small chance of surviving unless they were in their teens or chosen for medical experiments. Yet even then the likely-hood of survival was bleak. This mass genocide took many young innocent lives. 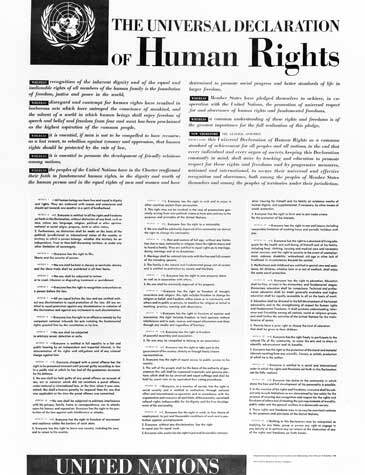 The Universal Declaration of Human Rights was the result of the experiences during the Second World War and was adopted by the United Nations General Assembly on December 10, 1948 in Paris. It encompasses specific standards for women, children, persons with disabilities, minorities, and other vulnerable groups. These groups now have rights that protect them from discrimination, which had long been common in many societies. The document is also part of the International Bill of Human Rights. This document was mainly written after World War Two because of the Holocaust. The United Nations disapproved of the Nazi's murder of Jews for a big reason. Hitler killed the Jews and about 100,000-200,000 non-Jews because they did not fit his Aryan society. The Nazi's would kill the elderly, women with young children, young children because they were too young for work, and those with disabilities because in the Nazi's eyes, they were unfit for labor and were deemed useless.